Twitter launches analytics app Engage for iOS. 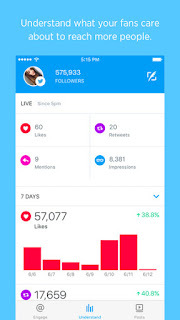 Twitter Engage, a new companion app for Twitter, is available today and provides real-time data and insights, allowing you to quickly understand, engage, and grow your audiences. You can download Twitter Engage today by visiting the App Store (note: Twitter Engage is only available for iOS and in the United States).